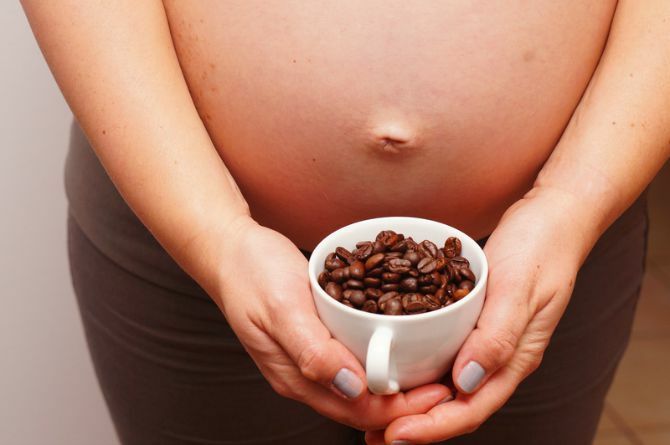 Coffee Time: Caffeine and pregnancy: what's safe? The jury is out on whether caffeine can actually hurt baby, but most health-care professionals do recommend limiting intake. Caffeine is a diuretic, meaning it pulls fluids and calcium from both you and baby and will keep you running to the bathroom (as if you aren't peeing enough already). Also, caffeine has no nutritional value and can affect your mood, sleep schedule and iron absorption. And it’s not just the coffee — remember, caffeine is also found in most teas, soft drinks and chocolates. Play it safe by totally eliminating caffeine, but if you simply can’t kick the habit, at least cut back. Some studies show that excessive caffeine consumption (more than 200 milligrams or one to two 8-ounce cups a day) can increase chances of miscarriage or premature birth. Going cold turkey can be tough, so try lowering your caffeine intake gradually. If you’re a coffee drinker, work your way down to half-caf before becoming a full-fledged decaf drinker. Exercise and frequent small meals (good ideas whether or not you're kicking a habit) will help keep up your energy during the withdrawal. If you just like to have a tasty drink on your desk, try mixing fruit juice with sparkling water instead, or customize decaffeinated tea by adding cinnamon, cloves or bits of your favorite fruit. Though herbal teas usually don't have caffeine, run the ingredient list by your doctor first — some may not be safe for baby. Caffeine crosses the placenta. So as caffeine increases your heart rate and metabolism, and makes you feel more alert, it can affect your unborn baby in the same way. This means that he may become a bit unsettled after you've had a coffee. However, a mug or two of tea or coffee a day won’t harm your baby.